Project obstacles and solutions: Buck Creek flows into the White River at Morrow's Meadow Park in Yorktown, Indiana. For years, the bank of the creek had been eroding in the park and was unstable. The city had attempted to control the erosion by placing concrete blocks along the waterline. However, they had not sought proper permits from the Indiana Department of Environmental Management (IDEM) which oversees waterways throughout the state. The city was fined and required to find another solution. Flatland Resources was hired to design and implement a plan to control the erosion problem. They removed the concrete blocks and looked for a natural solution to slow the velocity of the water against the creek's banks. They engineered a series of j-hooks against the shoreline. 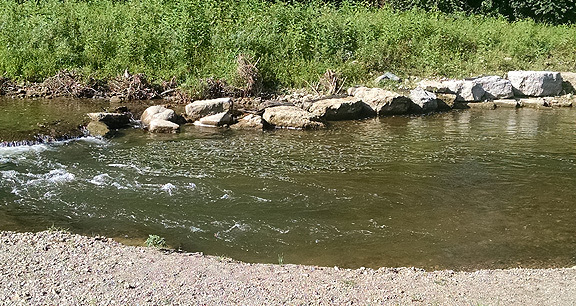 These are stone weirs that redirect the flow of the current back to the middle of the creek. To meet IDEM requirements, Flatland Resources was looking for a natural stone, 18-24 inches high and 6 feet long that could serve as the j-hooks. IMI Aggregates in Muncie supplied rough hewn limestone for the project. The stone was hand selected to step down into the creek.